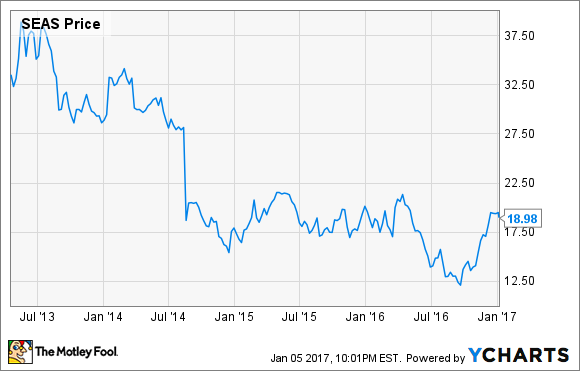 Seaworld Entertainment has had a rough couple of years to say the least, but in the second half of 2016 the stock took a turn for the better. Here's what's keeping this company's head above water. Shares of SeaWorld Entertainment, Inc. (NYSE:SEAS) rose 12% throughout December according to S&P Capital IQ data, after the company received and analyst upgrade and announced new key initiatives, such as developing a new SeaWorld park that will be the first not to have live orcas. SeaWorld stock has been sinking steadily in the last few years. Publicity started mounting from animal-welfare groups such as PETA, as well as a few high-profile and unsavory accounts of SeaWorld's actions, such as the Blackfish documentary and a memoir by a former SeaWorld orca trainer called Beneath the Surface. These public outcries against the company have combined to drive people away from the parks. SeaWorld has made some incredible progress in the second half of 2016 to grow its share price from a low around $12 up to $19 by the end of the year. Analysts at Janney Montgomery Scott upgraded the stock to a buy mid-December, and average estimates among all analysts covering the stock are that SeaWorld's earnings will reverse course in 2017, with increased sales and earnings of $0.17 per share for the year. In 2015, SeaWorld got a new CEO, who's trying to drive non-animal entertainment, such as by replacing orca shows with roller coasters as the company's San Diego park is doing this month. The company is even planning to open a new park in Abu Dhabi in 2022 that will be its first park without any orcas at all. SeaWorld has made some big financial moves as well. Most recently, the company announced that it will eliminate about 320 jobs, and while that looks negative, it could be part of the continued turnaround to restructure the business and more prudently manage costs, similar to the decision to cut its dividend in September. SeaWorld's troubles in the past few years have come during a time when theme parks near some of its most important destinations such as Orlando have been thriving, including Disney's theme parks and Universal Studios owned by Comcast, which have each seen a steady rise in attendance and ticket sales over the past few years. Therefore, it's hard to blame market forces rather than SeaWorld's specific situation. Looking to the year ahead, SeaWorld's December bump is a positive note for bullish investors who have seen the stock price nearly double in six months. Still, let's not forget that the company's Q3 earnings showed that attendance for the first nine months of the year was down 2.5% over the same period last year. SeaWorld has made some impressive moves lately, but it might be worth sitting on the sidelines until there's real evidence that attendance and/or sales are on the way back up.